A hybrid contact lens offers the “best of both worlds” for everyday patients as well as for patients with compromised corneas. Hybrid lenses are a familiar size (the same as a soft lens) and deliver clear, crisp vision from a GP (or “rigid” lens) center and comfort from the soft material that surrounds the GP. Clear Vision and ComfortEnjoy clear, crisp vision from the GP center of the lens and comfort from the soft outer portion of the lens. Ideal for all-day wear due to the continuous flow of tears underneath the lens during the day. Hassle-Free WearReduce the hassles in your life. 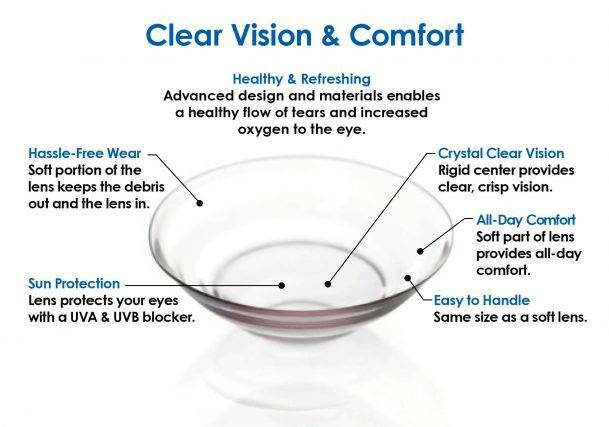 UltraHealth is a familiar size… the same as a soft lens, making it easier to handle. And, the soft part of the lens holds the lens in your eye and helps keep the debris out. Healthy & RefreshingThe advanced design allows for a healthy flow of tears to circulate under the lens with each and every blink. The new materials allow more oxygen to flow through the lens to your eye. Sun ProtectionEnjoy added sun protection from the UVA and UVB blocker in the lens.